For more information or to book one of our venues listed below, please contact: info@woodstockguild.org or call 845.679.2079. For all wedding inquiries, please contact: weddings@woodstockguild.org. The BYRDCLIFFE Kleinert/James Center for the Arts, located in the center of Woodstock, has been described as the best intimate music hall in the region. Renovated in 2006, the fifteen hundred square foot space is a gallery, concert hall, and celebration space. The space includes a raised stage, approximately 10′ x 28′, and the seating area accommodates an audience of 136. This multi-arts venue can be rented year-round, is universally accessible and air conditioned. We have an excellent 1923 Steinway “B” 7′ concert grand piano which has attracted many world class players, and backstage facilities include a dressing room and greenroom. -For rental fees, please email info@woodstockguild.org or call 845.679.2079. The Byrdcliffe Barn is a beautiful one hundred year old structure at the heart of the Byrdcliffe Art Colony, placed in 1979 on the National Register of Historic Sites. Built by visionaries with a utopian idea of creating an artists community in nature, the Barn continues to serve today as a site for performances, theater, and celebrations. Fees for Barn rental help sustain and maintain our mountainside not-for-profit arts community. 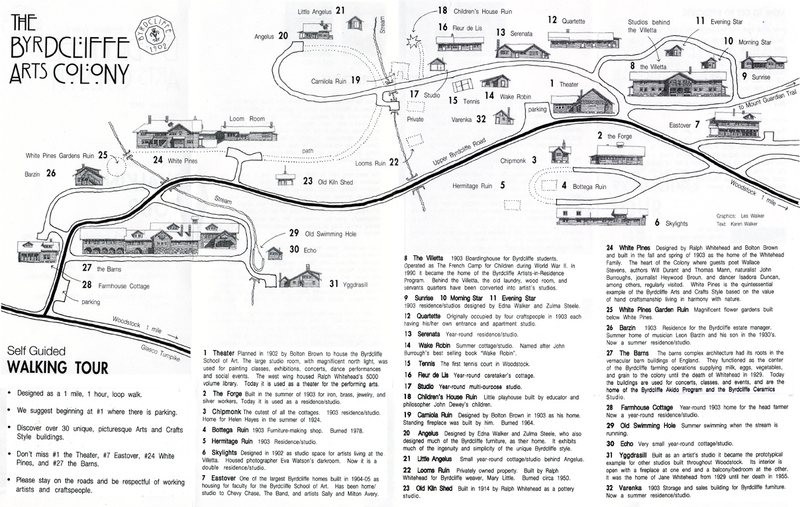 The Byrdcliffe Barn is one hundred feet long and thirty feet wide. The interior accommodates groups of 135 at table seating, with lots of room for a dance floor and set up space. The lawn of the adjacent White Pines, home of the founder of Byrdcliffe, is also available for outdoor and tented events. -For musical events and other single-day usage of the Barn, please email info@woodstockguild.org or call 845.679.2079. 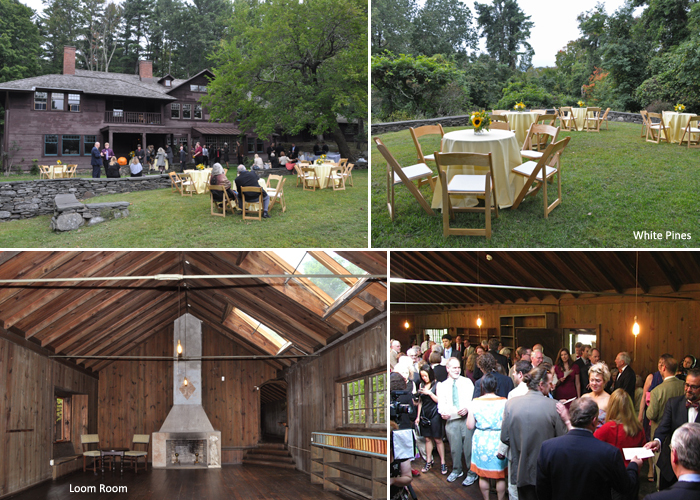 Read the Hudson Valley Green online blog about the Byrdcliffe Barn as a wonderful venue for weddings! 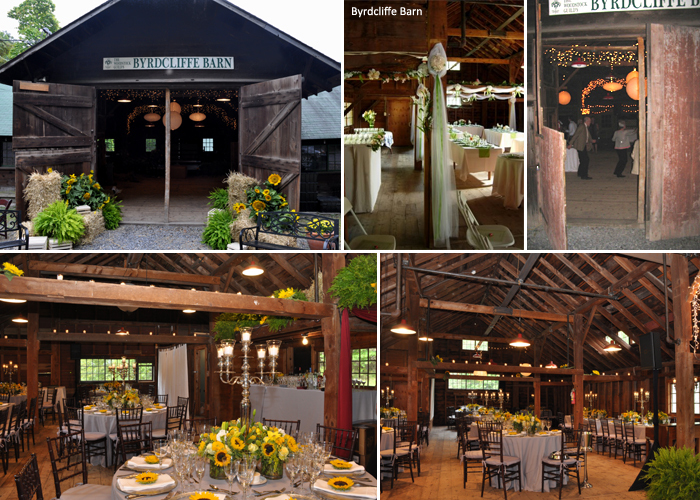 See a video (password: byrdcliffe) of a recent wedding rental at White Pines’ Loom Room and the Byrdcliffe Barn! White Pines is the 1903 handbuilt home of the founders of Byrdcliffe, designed by Ralph Radcliffe Whitehead and Bolton Brown. White Pines is the quintessential example of the Byrdcliffe Arts and Crafts style based on the value of hand craftsmanship living in harmony with nature, and was the heart of the Art Colony where poet Wallace Stevens, Authors Will Durant and Thomas Mann, naturalist John Burroughs, journalist Heywood Brown and dancer Isadora Duncan, among others, regularly visited. The White Pines’ grounds can be rented for weddings and private parties. A tent (in the case of rain) can be set up on the White Pines lawn for any event. -White Pines’ grounds: for rental fees, please email info@woodstockguild.org or call 845.679.2079. 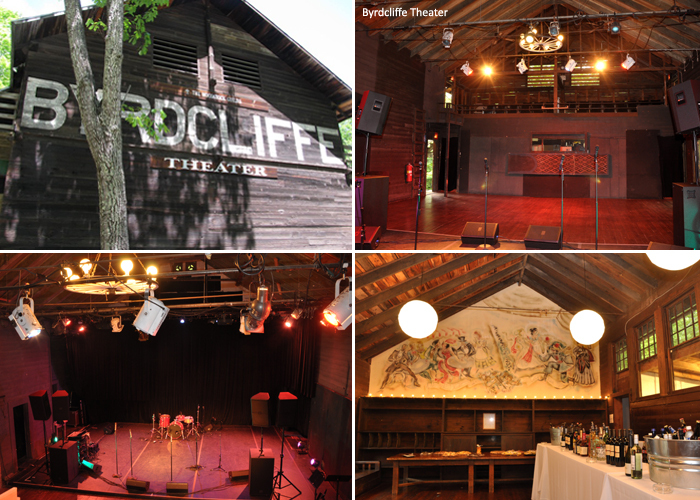 The Byrdcliffe Theater, constructed as part of the original Byrdcliffe Art Colony, is an intimate space that seats 100 people, with 60 movable seats at stage level and 40 seats in the balcony. The stage is 29′-3″ by 20′, with a marley floor. The lobby has facilities for ticket sales and intermission refreshments, and the adjoining stone terrace provides a pleasant outdoor gathering space. Lighting at the Theater includes a 24 channel 2 scene preset manual control lighting console and 18 – 6” Fresnel spotlights. There are also 10 – PAR 56 spotlights of various widths (6 wide flood, 2 medium flood and 2 narrow spot). The Theater’s sound system is a PA (public address) system with an amplifier and 4 microphone inputs (and mics also) and 2 speakers. Backstage facilities include two dressing rooms and three bathrooms (two public bathrooms and one for the performers). In its one hundred year history, the theater has hosted many dance, drama, opera, and musical performances. -Theater Groups / Musical Performance: for rental fees, please email info@woodstockguild.org or call 845.679.2079.